John Gastil, et al. 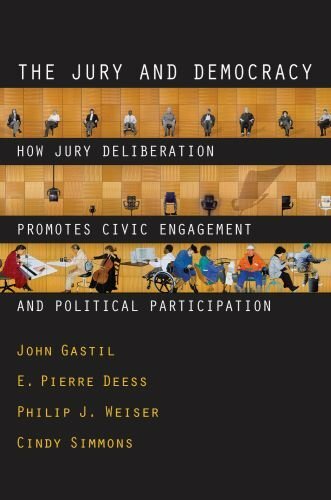 The jury and democracy : how jury deliberation promotes civic engagement and political participation. Oxford University Press, 2010. Alexis de Tocqueville, John Stuart Mill, and the U.S. Supreme Court have all alleged that jury service promotes civic and political engagement, yet none could prove it. Finally, this book provides compelling systematic evidence to support this view. Drawing from in-depth interviews, thousands of juror surveys, and court and voting records from across the United States, the authors show that serving on a jury can trigger changes in how citizens view themselves, their peers, and their government--and can even significantly increase electoral turnout among infrequent voters. Tom Ruys. 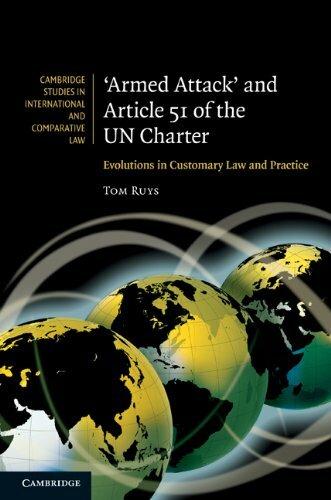 'Armed attack' and Article 51 of the UN Charter : evolutions in customary law and practice. Cambridge University Press, 2010. This book examines to what extent the right of self-defense, as laid down in Article 51 of the Charter of the United Nations, permits States to launch military operations against other States. In particular, it focuses on the occurrence of an 'armed attack' - the crucial trigger for the activation of this right. The notion of 'armed attack' is examined from a threefold perspective. What acts can be regarded as an 'armed attack'? When can an 'armed attack' be considered to take place? And from whom must an 'armed attack' emanate? Human rights in the twentieth century / edited by Stefan-Ludwig Hoffmann. Cambridge University Press, 2011. Berkshire encyclopedia of sustainability. Volume 3, The law and politics of sustainability / edited by Klaus Bosselmann, Daniel S. Fogel, J.B. Ruhl. Berkshire Publishing Group, c2011. Deborah Schildkraut. Americanism in the twenty-first century : public opinion in the age of immigration. Cambridge University Press, 2011. Courts in Latin America / edited by Gretchen Helmke, Julio Rios-Figueroa. Cambridge University Press, 2011. Sandra Day O'Connor. The majesty of the law [sound recording] : reflections of a Supreme Court Justice. Random House Audio, 2003. Prostate cancer : new questions about screening and treatment : hearing before the Committee on Oversight and Government Reform, House of Representatives, One Hundred Eleventh Congress, second session, March 4, 2010. The recently announced revisions to the Home Affordable Modification Program (HAMP) : hearing before the Subcommittee on Housing and Community Opportunity of the Committee on Financial Services, U.S. House of Representatives, One Hundred Eleventh Congress, second session, April 14, 2010. Impact of proposed legislation on the District of Columbia's gun laws : hearing before the Committee on Oversight and Government Reform, House of Representatives, One Hundred Tenth Congress, second session, September 9, 2008. Recent Inspector General reports concerning the FBI : hearing before the Subcommittee on Crime, Terrorism, and Homeland Security of the Committee on the Judiciary, House of Representatives, One Hundred Eleventh Congress, second session, February 24, 2010. Pay to delay : are patent settlements that delay generic drug market entry anticompetitive? : hearing before the Subcommittee on Courts and Competition Policy of the Committee on the Judiciary, House of Representatives, One Hundred Eleventh Congress, first session, June 3, 2009. The future of the Coast Guard dive program : hearing before the Subcommittee on Oceans, Atmosphere, Fisheries, and Coast Guard of the Committee on Commerce, Science, and Transportation, United States Senate, One Hundred Tenth Congress, first session, March 28, 2007. Afghanistan and Pakistan : resourcing the civilian surge : hearing before the Subcommittee on National Security and Foreign Affairs of the Committee on Oversight and Government Reform, House of Representatives, One Hundred Eleventh Congress, first session, May 19, 2009. The National Archives' ability to safeguard the nation's electronic records : hearing before the Subcommittee on Information Policy, Census, and National Archives of the Committee on Oversight and Government Reform, House of Representatives, One Hundred Eleventh Congress, first session, November 5, 2009. The National Science Foundation's fiscal year 2011 budget request : hearing before the Subcommittee on Research and Science Education, Committee on Science and Technology, House of Representatives, One Hundred Eleventh Congress, second session, March 10, 2010. NIST structure and authorities, its role in standards, and federal agency coordination on technical standards : hearing before the Subcommittee on Technology and Innovation, Committee on Science and Technology, House of Representatives, One Hundred Eleventh Congress, second session, March 23, 2010. How can NIST better serve the needs of the biomedical research community in the 21st century? : hearing before the Subcommittee on Technology and Innovation, Committee on Science and Technology, House of Representatives, One Hundred Eleventh Congress, second session, February 24, 2010. U.S. promotion of the Afghan economy : impediments and opportunities : hearing before the Subcommittee on National Security and Foreign Affairs of the Committee on Oversight and Government Reform, House of Representatives, One Hundred Eleventh Congress, first session, July 14, 2009. Strengthening undergraduate and graduate STEM education : hearing before the Subcommittee on Research and Science Education, Committee on Science and Technology, House of Representatives, One Hundred Eleventh Congress, second session, February 4, 2010.
Credit default swaps on government debt : potential implications of the Greek debt crisis : hearing before the Subcommittee on Capital Markets, Insurance, and Government Sponsored Enterprises of the Committee on Financial Services, U.S. House of Representatives, One Hundred Eleventh Congress, second session, April 29, 2010. SECURE Water Act : hearing before the Subcommittee on Water and Power of the Committee on Energy and Natural Resources, United States Senate, One Hundred Eleventh Congress, second session, to receive testimony on the Bureau of Reclamation's implementation of the SECURE Water Act, Title 9501 of P.L. 111-11, and the Bureau of Reclamation's WaterSMART program, which includes the WaterSMART grant program, the Basin Study program, and the Title XVI program, March 16, 2010. H.R. 960, and H.R. 1045, greater autonomy for the nation's capitol : hearing before the Subcommittee on Federal Workforce, Postal Service, and the District of Columbia of the Committee on Oversight and Government Reform, House of Representatives, One Hundred Eleventh Congress, first session, on H.R. 960 ... H.R. 1045 ... November 18, 2009. Transnational drug enterprises : threats to global stability and U.S. national security from Southwest Asia, Latin America, and West Africa : hearing before the Subcommittee on National Security and Foreign Affairs of the Committee on Oversight and Government Reform, House of Representatives, One Hundred Eleventh Congress, first session, October 1, 2009.
Credit Card Fair Fee Act of 2009 : hearing before the Committee on the Judiciary, House of Representatives, One Hundred Eleventh Congress, second session, on H.R. 2695, April 28, 2010. Additional discussion of H.R. 5175, the DISCLOSE Act, Democracy is Strengthened by Casting Light on Spending in Elections : hearing before the Committee on House Administration, House of Representatives, One Hundred Eleventh Congress, second session, held in Washington, DC, Tuesday, May 11, 2010. Developing federal employees and supervisors : mentoring, internships, and training in the federal government : hearing before the Oversight of Government Management, the Federal Workforce, and the District of Columbia Subcommittee of the Committee on Homeland Security and Governmental Affairs, United States Senate, One Hundred Eleventh Congress, second session, April 29, 2010. The domestic epidemic is worse than we thought : a wake-up call for HIV prevention : hearing before the Committee on Oversight and Government Reform, House of Representatives, One Hundred Tenth Congress, second session, September 16, 2008. Protecting intellectual property rights in a global economy : current trends and future challenges : hearing before the Subcommittee on Government Management, Organization, and Procurement of the Committee on Oversight and Government Reform, House of Representatives, One Hundred Eleventh Congress, first session, December 9, 2009. Post-Katrina recovery : restoring health care in the New Orleans region : hearing before the Committee on Oversight and Government Reform, House of Representatives, One Hundred Eleventh Congress, first session, December 3, 2009. Markup of H.R. 5175, the DISCLOSE Act, Democracy is Strengthened by Casting Light on Spending in Elections : meeting before the Committee on House Administration, House of Representatives, One Hundred Eleventh Congress, second session, held in Washington, DC, Thursday, May 20, 2010. Help Find the Missing Act, or Billy's Law : hearing before the Subcommittee on Crime, Terrorism, and Homeland Security of the Committee on the Judiciary, House of Representatives, One Hundred Eleventh Congress, second session, January 21, 2010. Keeping youth safe while in custody : sexual assault in adult and juvenile facilities : hearing before the Subcommittee on Crime, Terrorism, and Homeland Security of the Committee on the Judiciary, House of Representatives, One Hundred Eleventh Congress, second session, February 23, 2010. Assessing the Merida Initiative : a report from the Government Accountability Office (GAO) : hearing before the Subcommittee on the Western Hemisphere of the Committee on Foreign Affairs, House of Representatives, One Hundred Eleventh Congress, second session, July 21, 2010. Legislative proposals to preserve public housing : hearing before the Subcommittee on Housing and Community Opportunity of the Committee on Financial Services, U.S. House of Representatives, One Hundred Eleventh Congress, second session, April 28, 2010. Transportation Worker Identification Credential (TWIC) implementation : hearing before the Committee on Commerce, Science, and Transportation, United States Senate, One Hundred Tenth Congress, first session, April 12, 2007. Recent setbacks to the Coast Guard Deepwater Program : hearing before the Subcommittee on Oceans, Atmosphere, Fisheries, and Coast Guard of the Committee on Commerce, Science, and Transportation, United States Senate, One Hundred Tenth Congress, first session, February 14, 2007. Investment management and acquisition challenges at the Department of Homeland Security : hearing before the Subcommittee on Government Management, Organization, and Procurement of the Committee on Oversight and Government Reform, House of Representatives, One Hundred Eleventh Congress, first session, September 15, 2009. Promoting small and micro enterprise in Haiti : hearing before the Subcommittee on International Monetary Policy and Trade of the Committee on Financial Services, U.S. House of Representatives, One Hundred Eleventh Congress, second session, April 28, 2010. IT procurement and disposal : application of the federal government's green policies in the life cycle management of IT assets : hearing before the Subcommittee on Government Management, Organization, and Procurement of the Committee on Oversight and Government Reform, House of Representatives, One Hundred Eleventh Congress, first session, October 27, 2009.